Just because you’re working to improve your diet doesn’t mean you have to give up sugar and sweets. 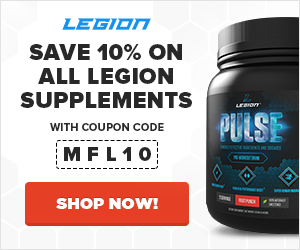 You can keep the calories under control by using creative ingredient tweaks like using Greek yogurt instead of butter and cutting the flour with protein powder, which means you will have no trouble fitting your creations into your meal plans. Many of these cupcake recipes create the seemingly impossible: 100-calorie treats. Enjoy! 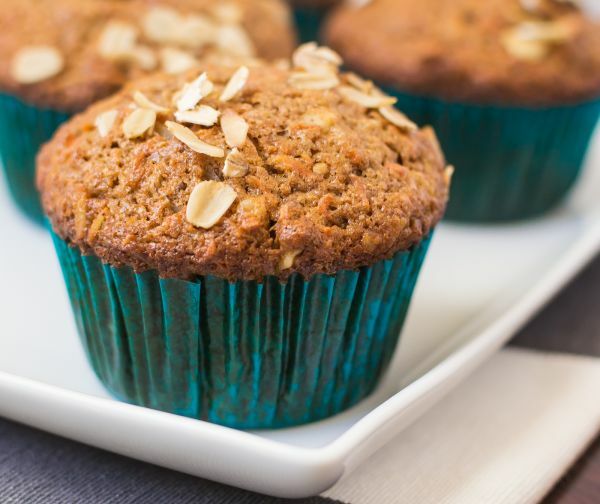 This recipe might call the final result a muffin, but if you choose to add cream cheese frosting to the top, no one will be the wiser. And to make an even healthier snack, top them with protein frosting: Mix a couple scoops of vanilla whey with equal parts Greek yogurt and cream cheese; add milk to thin, if necessary. 1. Put 2 racks in the center of the oven, and preheat the oven to 350°F. Add liners to cupcake baking pan, sprinkle half the oats inside, and set aside. 2. In a medium bowl, sift together whole-wheat flour, protein powder, baking soda, cinnamon, ginger, and salt. Set aside. 3. In a large bowl, use an electric mixer on medium speed to combine brown sugar and oil. Beat in the yogurt and applesauce until fully combined. Mixture will be gritty and thin. Add the eggs one at a time, beating well after each addition. Mix in the vanilla. 4. With a spatula, manually stir the dry ingredients into the wet ingredients until just combined. All flour pockets should be gone, but do not overmix. Fold in the finely shredded carrots, shredded coconut, raisins, and walnuts. Divide batter among prepared cupcake pans. Sprinkle the remaining oats on top. 5. Bake for 20–23 minutes, or until a toothpick inserted in the center comes out clean or with a few crumbs. What’s better than moist, rich flourless chocolate cake? 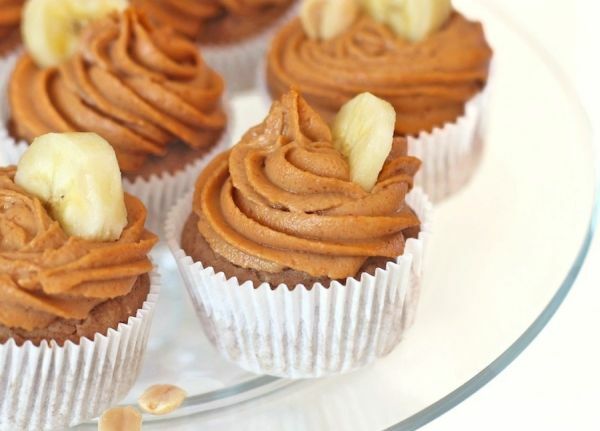 These cupcakes, which contain six simple ingredients, including hazelnut. So you may as well call them Nutella cupcakes! 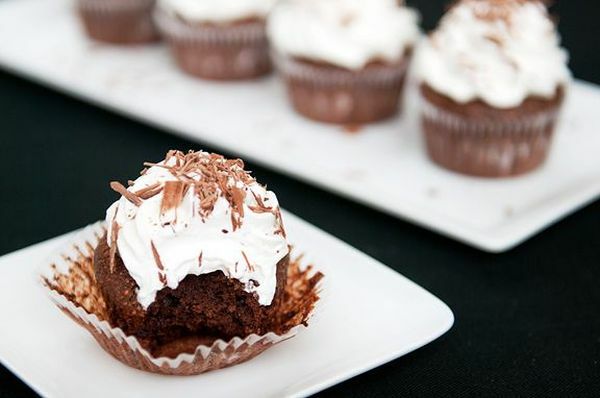 Or smear the chocolatey spread onto these cupcakes to attack your Nutella cravings with a one-two punch. 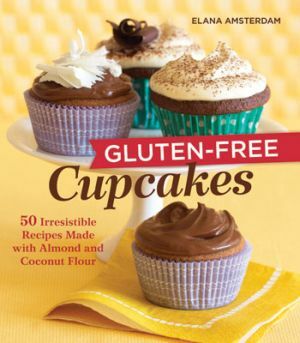 For more wheat-free recipes, get Gluten-Free Cupcakes by Elana Amsterdam. 1. Preheat the oven to 350°F. Line ten muffin tins with paper liners. 2. Combine the chocolate chips and hazelnuts in a food processor and process until they have the consistency of coarse sand. Add the eggs and agave nectar, and pulse for 10 seconds until combined. Add vanilla extract and sea salt, and pulse for another ten seconds. 3. Scoop 1/4 cup of the batter into each muffin tin. Bake 20 to 25 minutes, until a toothpick inserted in the center of a cupcake comes out clean. 4. Let the cupcakes cool in the pan for about an hour. Frost or top with whipped cream (not included in nutrition facts), and then serve. Cupcakes without added sugar, you ask? These babies rely on the natural sugars in bananas to get most of their sweetness, as well as a splash of stevia extract to boost the flavor. If you stick with non-dairy milk and yogurt, you’ll wind up with a slightly spiced vegan cupcake. Of course, it’s also possible to use regular milk and Greek yogurt, if that’s what’s in the fridge. 1. Preheat the oven to 350°F. Use paper liners or parchment paper to prep the tins to make 14 cupcakes. 2. In a small bowl, whisk together the quinoa flour, baking powder, baking soda, salt, cinnamon, and nutmeg. 3. In a large bowl, stir together the almond milk, mashed banana, yogurt, stevia, vanilla, and butter extract. 4. Slowly add the dry into the wet while stirring, and fold the batter well. Scoop the batter into the prepared cupcake tins, and tap the pan on the counter a few times to level. 5. Bake for 18 –20 minutes, or until cupcakes spring back when tapped. A couple minutes after removing them from the oven, transfer the cupcakes to a wire cooling rack. 6. Make the frosting in a medium-sized bowl, stir together the peanut flour, sweetener, and milk. Scoop into a piping bag, and frost the cupcakes once they are sufficiently cooled. 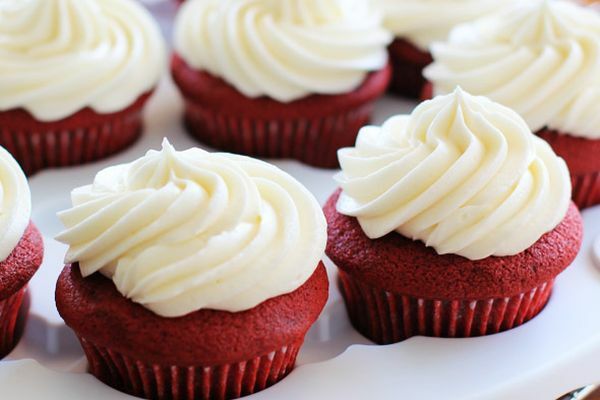 These cupcakes use lentils for depth of flavor and beets for the classic color because after all, what would red velvet cupcakes be without that rich color? When you use beets, the red looks a lot more decadent and a lot less garish. Plus, these treats have enough nutrients to justify the sinful flavor. 1. Bring 1 cup of water to a boil and add the lentils. Let simmer rapidly for a minute or so, then reduce to a gentle simmer and let them cook until they’re soft, about 20 minutes. Mash the as much as you can by hand, and set aside to let cool completely. 2. Preheat the oven to 350°F. Line muffin tins with 18 cupcake liners. 3. Shred the beet, and set aside. 4. In a medium bowl, whisk together the flour, baking powder, salt, and cocoa powder. Set aside. 5. In the bowl of an electric mixer, cream the butter and cream cheese. (If using coconut oil, beat the cream cheese by itself until it’s fluffy, and then slowly pour in the oil.) Add the lentils, and beat until smooth. Mix in the sugar. Reduce speed to low, and add the eggs, vanilla, and beets. 6. Slowly spoon the dry ingredients into the batter, and mix well. Do not overbeat. 7. Fill cupcake liners about two-thirds full. Bake for 20–25 minutes, or until a toothpick inserted in the middle comes out clean. Transfer to a cooling rack. 8. Place the cream cheese and butter in the bowl of an electric mixer and cream together on medium until smooth, 2-3 minutes. Drizzle in the maple syrup, and mix until smooth. If the frosting is a bit sticky from the maple syrup, add arrowroot powder 1 tablespoon at a time until smooth. 9. Spoon maple cream cheese frosting on top of cooled cupcakes, and serve. 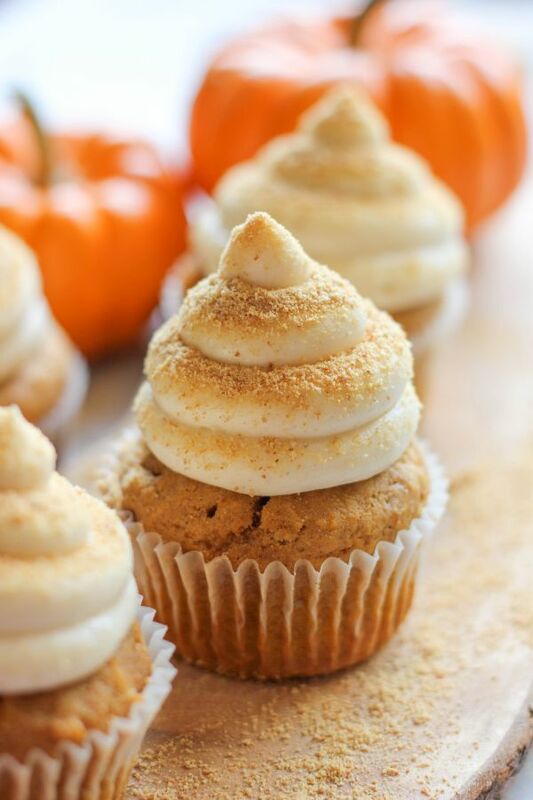 These pumpkins cupcakes are as satisfying as anything you’ll buy in a bakery, but the final result is a lot easier to justify eating. Eat them plain to enjoy the interplay of fall spices, or top with some vanilla Greek yogurt and a sprinkle of cinnamon brown sugar for even more indulgent flavor. 1. Preheat the oven to 350°F. Grease 12 silicone cupcake cups, or line a standard muffin pan. 2. Set aside 3 tablespoons of graham cracker crumbs. Add the remainder to the bowl of a food processor or blender, along with all other ingredients: pumpkin puree, eggs, almond milk, coconut flour, whey protein, yogurt, sugars, vanilla extract, spices, salt, and baking powder. 3. Evenly distribute the cupcake batter among the prepared silicone baking cups or lined pan. Top with the remaining graham cracker crumbs. 4. Bake the healthy cupcakes for 25–30 minutes. Let cool completely before digging in. Cupcakes, cheesecake, and Cool Whip? It’s impossible to resist these light bites, which are especially good with fresh fruit on top like raspberries or blueberries. For real lemonheads, top with candied lemon peel so there are no other flavors competing with the scrumptious sour-sweet combo. Completing the picture perfect dessert is a vanilla wafer cookie at the bottom to act as a simple crust. 2. Prepare a standard 12-cup muffin tin with paper liners. Place one vanilla wafer at the bottom of each liner. 3. Using an electric mixer, beat cream cheese, sugar, and vanilla on medium speed until smooth. Beat in yogurt, egg whites, lemon juice, lemon zest, and flour until well blended. Pour into cupcake liners, filling halfway. 3. Bake for 25 minutes, or until center is almost set. Cool in pans at room temperature for 15–20 minutes. Before removing cheesecakes from muffin cup, let them chill for a couple hours in the refrigerator. 4. Add a tablespoon of Cool Whip Lite to each cupcake, and top with fresh berries. Can chocolate cupcakes be as healthy as they are decadent? You bet. 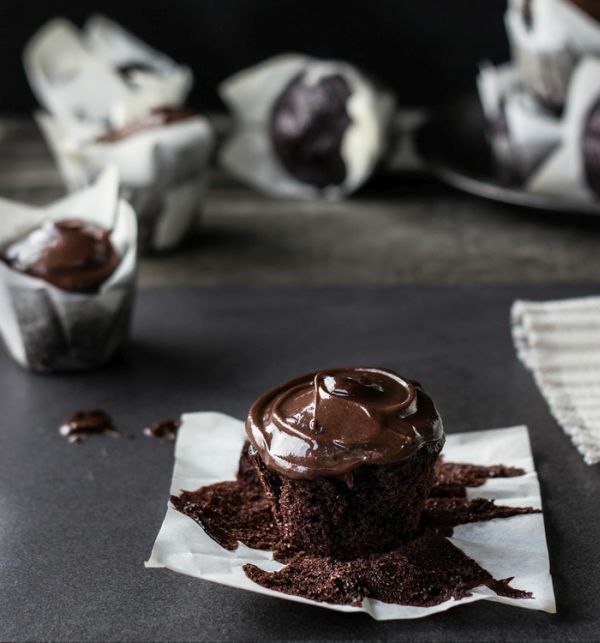 These cupcakes pack enough flavor to match the deep, dark color, meaning your craving will be squashed whether it’s for chocolate or cake or both. But inside there’s a secret ingredient for sweetness and nutrition: shredded carrots. This creates a denser cake that has fewer calories all the while adding a little fiber, nutrients like potassium, and vitamins including B6 and K.
2. Put the finely grated carrot into a fine mesh strainer. Hold the strainer over a sink and squeeze the grated carrot to remove as much liquid as possible. Place into a medium bowl. 3. Add the melted oil, egg, and buttermilk. Once combined, mix in the flour, baking powder, baking soda, salt, sugar, and cocoa powder. Gently stir in the hot water. 4. Divide the batter between 12 lined muffin cups. Bake for 20 minutes (or until a toothpick comes out clean). Cool on a wire rack. 5. For the frosting, combine powdered sugar, cocoa powder, and cream cheese in a small bowl. Stir until smooth. Use about 2 teaspoons to frost each cupcake. 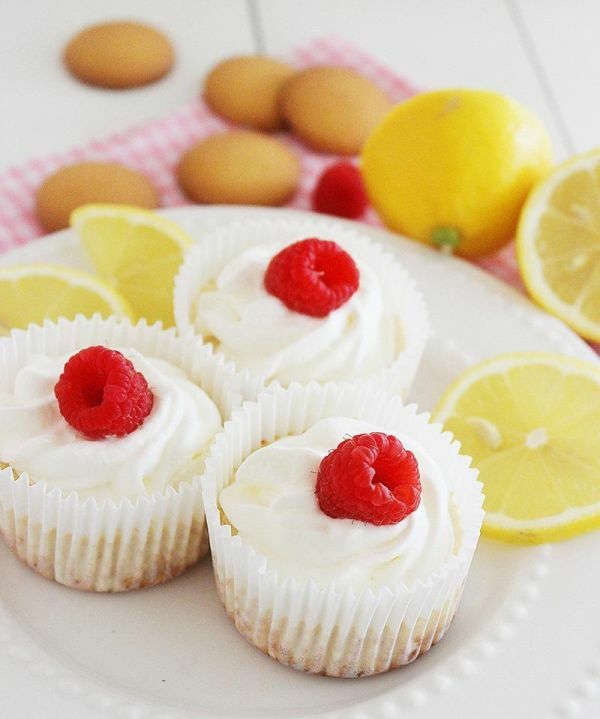 What did you think of these easy cupcake recipes? Have anything else to share? Let me know in the comments below!